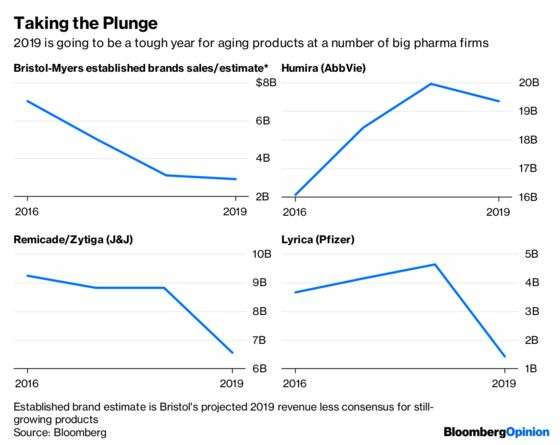 (Bloomberg Opinion) -- On a day when drugmakers’ pricing practices are set to be scrutinized at two separate Congressional hearings, the industry could have used a boost from one of its stalwarts. Instead, Pfizer Inc. became the latest of a group of big pharma firms to report disappointing earnings – in its case, full-year profit and revenue guidance that fell short of analysts’ estimates. Each company has its idiosyncratic issues, and the strong dollar isn’t helping. But they’re all facing headwinds that may become only more acute as the focus on pricing intensifies. Pharma’s eternal burden is replacing declining medicines with fast-growing new ones, and as it’s struggled to do so, it has been a particularly rough time for aging medicines. The U.S. Food and Drug Administration has been approving generic drugs at a record pace. That means sales and prices on existing treatments are plunging more quickly when their patents expire. Meanwhile, pharmacy benefit managers, the powerful middlemen that negotiate prices for health-care providers, have consolidated and combined with insurers. As a result, they are better than ever at extracting discounts from drugmakers. On top of all that, biosimilars – the equivalent of generics for biologic drugs made in living cells – have arrived to challenge these expensive medicines. In the past, the industry was able to turn to substantial price hikes to soften such blows. That’s not as much of an option anymore. This can be seen in the latest quarter’s results and current-year forecasts. AbbVie Inc. projected a bigger sales decline than analysts were expecting for its blockbuster inflammation drug Humira due to biosimilar competition outside of the U.S, while Johnson & Johnson and Pfizer both project multi-billion dollar sales blows from generic competition. Several firms anticipate net pricing decreases because bigger discounts will outweigh any price hikes they take. Newer drugs need to pick up the slack. But the already difficult job of discovering and profiting from novel treatments is also getting tougher. Issue number one is market crowding. A growing number of conditions have multiple treatments that are relatively new and sometimes very similar. That can mean pricing pressure and combat over market share from the very beginning. Both Pfizer and Bristol-Myers Squibb Co. experienced this dynamic with Eliquis, a key blood thinner that missed analysts’ sales estimates for the quarter. Pfizer’s breast-cancer drug Ibrance was a star performer in the fourth quarter, but is competing with similar medicines made by Eli Lilly & Co. and Novartis Inc. This year will likely be even tougher, which may be reflected in Pfizer’s soft guidance. The rest of the earnings season isn’t likely to turn sentiment around. A number of the companies that are most affected by crowding and aging medicines have yet to report. One of these is Amgen Inc., which faces biosimilar competition, a price war for a cholesterol medicine, and an intensely competitive migraine drug launch. It’s set to release earnings on Tuesday afternoon. To some degree, what’s happening is part of the normal drug cycle, and could be something of a hiccup. Plus, the decline of older medicines will create easier comps that may flatter new drug growth next year. But there is reason to be concerned about the structural health of the sector. And the industry still has to get through 2019.